Japan in 2013: New Dawn or Another False Start? 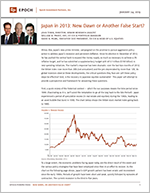 - Epoch Investment Partners, Inc.
Japan in 2013: New Dawn or Another False Start? Shinzo Abe, Japan’s new prime minister, campaigned on the promise to pursue aggressive policy action to address Japan’s recession and persistent deflation. Since his election in December of 2012, he has pushed the central bank to expand the money supply as much as necessary to achieve a 2% inflation target, and he has submitted a supplementary budget with ¥13.1 trillion ($150 billion) in new spending initiatives. The market’s response has been dramatic: over the last two months of 2012, the Nikkei index rose more than 20% (not annualized) and the yen depreciated by more than 12%. As global investors observe these developments, the critical questions they face are: will these policy steps be effective? And, is the recovery in Japanese equities sustainable? This paper will attempt to provide a perspective and framework for answering these questions. First, a quick review of the historical context — which for our purposes means the time period since 1980. (Fascinating as it is, we’ll avoid the temptation to go all the way back to the Edo Period!) Japan experienced a period of speculative excess (in real estate and equities) during the 1980s, leading to an asset bubble that burst in 1990. The chart below shows the Nikkei stock market index going back to 1980. To a large extent, the economic problems facing Japan today are the direct result of this event and the various policy strategies that have been employed since then in an effort to recover. As the chart on the following page shows, Japan’s GDP growth pattern has been erratic and inconsistent since the early 1990s. Periods of growth have been short and weak, quickly followed by episodes of contraction. The current recession is the third in five years. In addition to sluggish economic growth (the average rate of growth over the period shown in the previous chart is less than 1% per year) Japan has been plagued by a stubborn deflation. Perhaps not surprisingly, the period since 1990 has also been one of extreme political instability: Shinzo Abe is the 15th prime minister to serve since November of 1991. The average term in office for a Japanese prime minister has been a little over 18 months. With this as a backdrop, we return to our main focus: will the policy proposals of Prime Minister Abe finally allow Japan to break out of this cycle of weak growth and persistent deflation? Is this a new dawn for Japan and a signal to re-orient client portfolios to the surging Japanese market? Or yet another false start? Inflation is not a policy tool nor is it a policy goal. Abe’s prescription for combating deflation is to have the central bank print yen in unlimited quantities until inflation reaches 2%. As a matter of economic policy, this is overly simplistic — and dangerous. Simplistic because inflation will not, of itself, affect any real economic variable. It will not increase real GDP, industrial production, or employment. Dangerous because a central bank overseeing a fiat currency can always create inflation — the difficulty is controlling it. Some commentators have drawn parallels to Quantitative Easing (QE) in the U.S. and to Outright Monetary Transactions (OMT) in the Eurozone. In our view, the crucial difference with QE is that Ben Bernanke’s goal is to stimulate aggregate demand (through lower interest rates and/or a wealth effect) without triggering inflation. Whether he will succeed is the topic of heated debate. So far, however, we see encouraging signs of recovery in housing, autos, and employment, with inflation and inflation expectations staying low. In Europe, on the other hand, Mario Draghi’s pledge to do “whatever it takes” to preserve the euro was the catalyst for significant rallies in the euro, the European stock market, and peripheral country bonds. But the goal was (and is) to buy time while structural reforms are put in place. As with QE in the U.S., the ultimate success of the strategy is not yet known but early signs are encouraging: steps are being taken to forge a banking union for the euro zone, and individual countries have taken difficult but necessary steps toward fundamental reforms (such as raising the retirement age for pensions and passing labor market reforms). In both Europe and the U.S., aggressive, even unconventional, monetary policy was used to pursue conventional ends: growth in real GDP and lower unemployment. Japan’s debt to GDP ratio already exceeds 200%. The second component of Abe’s two-part plan is fiscal stimulus in the form of a supplementary budget. From an economic policy standpoint, this is less controversial than his “print whatever it takes” 2% inflation goal. Japan has tried multiple times over the past twenty years to use fiscal stimulus to instigate real growth without success, which raises doubts about why this time will be different. Perhaps more importantly, Japan’s fiscal state is now so precarious that its ability to use fiscal measures has been severely compromised. As the chart below shows, government spending and government revenues in Japan diverged sharply starting in 1990 as previous Prime Ministers rolled out successive deficit spending plans. The budgetary damage resulting from these previous rounds of deficit spending has been dramatic: Japan has the developed world’s highest government debt-to-GDP ratio at 205%. Advocating further deficit spending in this context is a policy prescription that should even make Paul Krugman blush (although it hasn’t). And, significantly, the increase in nominal interest rates that would accompany a “successful” increase in inflation to 2% could be highly detrimental to Japan’s budget by increasing the cost of servicing its outstanding debt. With the JGB 10-year rate at approximately 0.75% and inflation running at about minus 0.5%, it follows that real rates in Japan are currently about 1.25%. With an inflation rate of 2%, and if we assume a similar real rate, the nominal rate on Japanese government bonds would rise to more than 3%. This would increase the annual interest expense on ¥98.3 trillion of outstanding government debt (as of 9/30/12) by ¥2.2 trillion. Increase female participation in the labor force and reduce gender pay differences. The report shows that the gender pay gap in Japan is the second largest in the OECD (behind Korea). Relax restrictive immigration laws to allow more foreign students and high-skilled workers to enter Japan. Reduce labor market “dualism.” Japanese companies often hire “non-regular” workers to achieve flexibility and lower costs since regular workers are afforded employment protection.This practice has created a two-tiered labor market with non-regular workers accounting for 34% of total employment in 2010, double the share in 1990. Reduce trade barriers. Japan’s import penetration ratio was 12.4% in 2009 compared to the OECD average of 46.3%. To this end, Japan should move forward with participation in the Trans-Pacific Partnership, a regional free-trade agreement. Reduce barriers to foreign direct investment. The report points out that while Japan has been an active investor overseas, the stock of FDI in Japan was 3.9% of GDP in 2010, the lowest among OECD countries. Reform agricultural policy, in particular the supply management policy that maintains domestic prices above world prices for several commodities. None of these policy recommendations has been mentioned by Prime Minister Abe. What about the salutary effect of a weaker yen? To be sure, a weaker currency will improve the competitiveness of some Japanese exporters. But the benefit for Japan’s larger and more global businesses is mixed at best. For example, the auto companies long ago relocated production to end markets. Honda and Toyota will not sell more cars in the U.S because the yen is weaker. And those companies with domestic manufacturing in Japan will pay more for imported raw materials. It is difficult to say what the net benefit will be. Then there is the growing concern over “competitive devaluations.” If Abe’s real goal is a lower yen, veiled behind a 2% inflation target, the risk is that other countries will embark down a similar path and this becomes a “race to the bottom” and a replay of the “beggar thy neighbor” policies of the 1930s. While it has always been tempting to pull the currency lever when other policy options are no longer available or effective, the economic record of the past 100 years shows this strategy (by itself) never works. The bottom line is that Abe’s stimulus measures may provide a short-term lift to the economy, and almost certainly will drive the yen lower. But the likelihood that these steps alone will finally break Japan out of its two-decade funk seems quite low to us. The solution is not to print money, generate inflation for the sake of inflation, drive down the yen, and spend more borrowed yen. The solution is fundamental reform as outlined in the OECD report. We think the rally in the Nikkei over the past two months was a short-term, tactical trading opportunity (that we missed), but we remain skeptical about the longer-term prognosis for Japan under Prime Minister Abe. For now, we think the appropriate investment strategy is to remain underweight Japan. 1The final budget for FY 1975 to 2010; the revised budget for FY 2011; and the initial budge for FY 2012.